← Our new Christmas cards are now available! Starting today and ending Friday, November 20, all purchases of God With Us by David H. Petersen will be signed by the author. 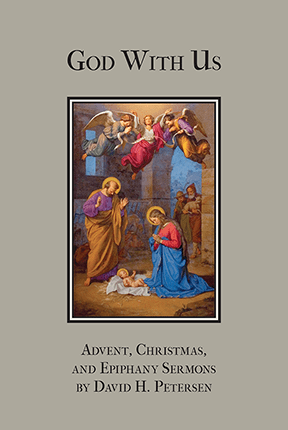 With Advent just 11 days away, now is the time to pick up a copy just in time for the start of the season. Read the reviews, learn how we developed the lectionary for this book, take a look at the Table of Contents and Scripture Index, and find excerpts throughout the site. Better yet, sign up for occasional emails on the right sidebar or follow us on Facebook, where we post more frequent excerpts. *Be sure to peruse our Christmas cards while you’re here. Reasonably priced, unique, gorgeous artwork…combined with a clear confession of our Savior’s birth. This entry was posted in Latest News and tagged God With Us, Petersen. Bookmark the permalink.